Can Chevy Justify Asking $70,000 For The 2018 Camaro ZL1 1LE? Given the performance hardware the package adds, this might actually be a killer deal. The slow and deliberate evolution of the muscle car is happening right before our eyes. Sure, they may stick to the same recipe—lots of power coming from a V8 of some sort, rear-wheel drive, high customizability, good looks and a manual transmission only a box tick away—but with each new generation that emerges, America’s iconic pony cars gain more ability on the track. The best thing about all of this is that the automakers that produce these cars are sticking to their promise to keep them cheap. 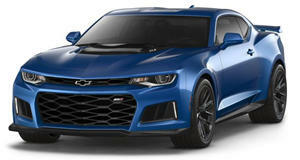 Okay, maybe $70,000 isn’t exactly cheap for a Camaro, which nearly matches the price tag of a 2LT Corvette Grand Sport, but take a look at the hardware added to the ZL1 with the 1LE Track Package and the $7,500 premium Chevy asks doesn’t seem so bad. Included in the price is racing-based suspension, aerodynamic technology, and Goodyear Eagle F1 Supercar 3R summer tires, which brings the grand total of the ZL1 1LE to $69,995 including the $995 destination and handling charge. Those three little add-ons may not sound like much until you consider what each includes. The aerodynamics goody bag adds an expensive carbon fiber rear wing, air deflectors, and dive planes on the front facia to the Camaro. The adjustable suspension takes it up a notch by including Chevy’s DSSV (Dynamic Suspension Spool Valve) dampers at the front and rear. Drivers who know what they’re doing can play around with the adjustable front-end ride height and three-way adjustable rear stabilizer bar to coax slightly better handling out of the car. Unfortunately, there are no carbon fiber wheels included here like they are on the Ford Mustang GT350R, which would justify the entire $7,500 price tag alone, but lightweight forged aluminum wheels remove an inch in diameter but add it back to the wheel’s width and take the place of the standard set installed on all four corners. Combined with the track-worthy Goodyear tires, the ZL1 equipped with the 1LE Track Package can pull 1.10g corners, a feat for which it can thank its 10% increase in footprint for. Despite the additions, what may matter more to some drivers is what the 1LE package removes—60 pounds of weight from the standard ZL1—shaved by the lightweight wheels and dampers, a fixed-back rear seat, and thinner rear glass. If you’re somehow still not convinced, you’ll just have to wait to see how close this $70,000 muscle car gets to outdoing competitors twice the price. If we were Corvette engineers, we’d be groaning right about now.